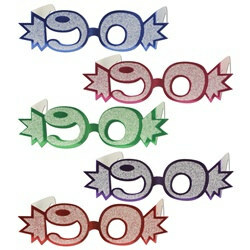 Celebrate an exceptional landmark and wear these Assorted 90 Glittered Foil Eyeglasses for your party. These Assorted 90 Glittered Foil Eyeglasses are a great favor to hand out to all 90th birthday party guests to add some decoration even to the guests! Each package includes one (1) pair of Assorted 90 Glittered Foil Eyeglasses fit for full head size.